The former Portland police chief is ready to lead on a statewide level. It was a hot night in July 2016, but that didn’t stop an overflow crowd from filling the pews at Green Memorial Church in Portland for a special community meeting. Two black men had been shot to death by police in Louisiana and Minnesota, sparking large protests in cities around the country, including Portland. In the city of Dallas, a sniper used one of the protests as cover, killing five police officers. Events were moving fast, and there was no telling where they would stop. The qualities Sauschuck showed that night, his courage to meet with the community, his lack of defensiveness, his understanding of others and his desire to work cooperatively, made him an outstanding community leader when he led the city’s Police Department. Those qualities should also make him an outstanding commissioner of public safety for the state. He deserves to be unanimously confirmed by the Senate when it votes on his nomination, perhaps as soon as this week. That is not likely to happen, however. Sauschuck’s nomination passed the Criminal Justice Committee on an 8-to-5 party-line vote, with all the Republicans voting against him. Sauschuck’s critics are entirely focused on one thing – and it has nothing to do with his job performance or his character. They won’t look beyond his perceived position on gun control. As police chief, Sauschuck took two positions on issues during a public debate. He joined other urban police chiefs in testifying against a bill (now a law) to allow adults to carry concealed firearms without a permit. And during the election of 2016, he endorsed a referendum that would have required background checks for private sales. Neither of these stances should be disqualifying. 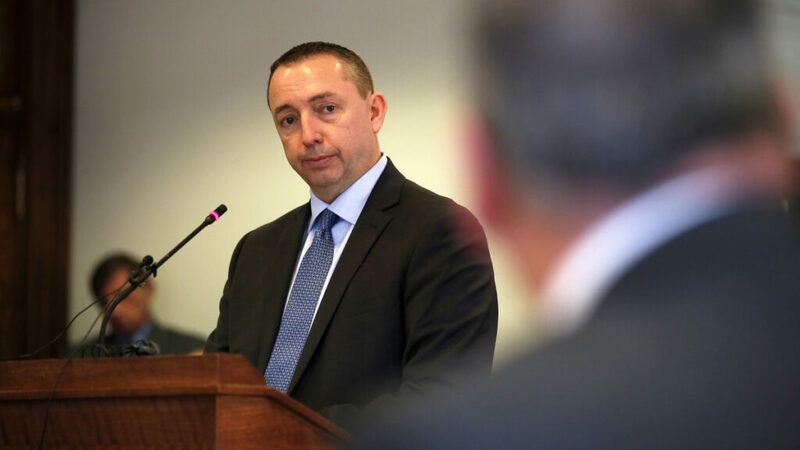 The public safety commissioner is an administrator who oversees the Maine State Police, the state Drug Enforcement Agency, the Police Academy and other bureaus. The commissioner does not make policy on gun regulations. There is nothing in Sauschuck’s career, as a U.S. Marine, as a street cop and as a command officer, to suggest that he would not enforce the law, regardless of his personal preferences. It would be a huge mistake to reject Sauschuck for sharing his considered opinion on a single issue, no matter how important that issue may be. Considering it his duty as a public official, he expressed his opinions on publicly debated issues. Punishing him for that now will make it harder to get honest opinions from other community leaders in the future. Sauschuck deserves to be evaluated for his whole career, not just two opinions that have nothing to do with the commissioner’s job. Maine deserves a chance to get the benefit of his leadership.